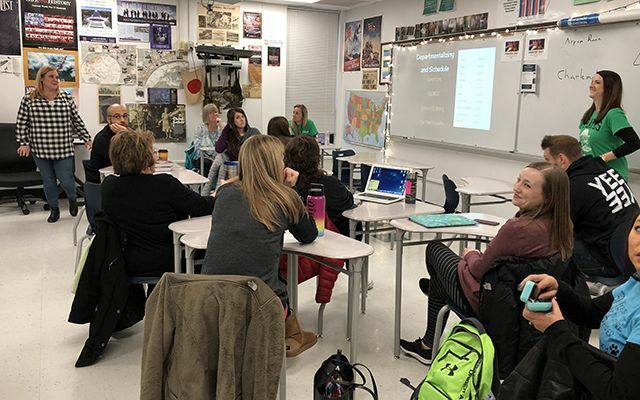 Certified and support staff in the Pattonville School District spent a day learning during the district's professional development day on Jan. 18. In the first part of the day, certified staff and paraprofessionals chose from approximately 80 different sessions led by Pattonville staff on a variety of topics during the second annual Pirate Rally. Support staff heard from guest speaker Roberto Rivera on thriving in their roles as they help Pattonville students succeed. Rivera is founder of The Good Life Foundation and chief empowerment officer of 7 Mindsets, a national leader in mindsets-based social and emotional learning. During the second part of the day, certified and support staff participated in an advanced refresher training at their buildings on how to respond to active intruder situations. The 4E (Educate, Escape, Evade or Engage) training is an active shooter safety program developed by Tier One Tactical Solutions. Officers from the St. Louis County Police Department led the training with the assistance of Pattonville staff members and local law enforcement officers. The training provides staff with different options on how to respond to active intruder situations and keep students safe. The training complies with a state law requiring school districts to prepare staff for handling an active shooter situation. In addition, transportation employees received CPR training during the second part of the day. Check out updates and photos from the day via Twitter at #PirateRally2019. A team of four teachers from Remington Traditional School give a presentation during Pirate Rally 2019 on how they personalized learning for their combined fourth- and fifth-grade classrooms. Drummond Elementary School teacher Denise Kuse discusses how she works with students in an after-school ukulele club and gives tips on how to play the instrument during Pirate Rally 2019. Guest speaker Roberto Rivera, founder of The Good Life Organization and chief empowerment officer of the 7 Mindsets, addresses support staff on how important their roles are in students' success. Pattonville superintendent Dr. Tim Pecoraro and former long-time board member Ralph Stahlhut gave a presentation on the History of Pattonville.